As I've mentioned before, I'm kind of religiously confused right now. Of course, I'm dealing with it in the mature way of ignoring it until I can't any longer. Very healthy. As such, I wouldn't normally introduce Veggie Tales into my home. But, Natalina fell in love with the cucumber on the cover at the library, and we brought it home with us. Since then, we've watched it a few times. To be honest, it's pretty great! The real-world lesson is 'don't be selfish,' something we're working hard on here, with limited success. The songs are catchy as all get out and based loosely on classical numbers. They address grammar and style. The animation isn't particularly annoying. I even kind of like the characters. In fact, here's a quick preview of the show. Suffice to say, I really like it, much to my surprise. I was totally crushed, then, when at the end of the episode a little weird dude comes out and tells my kids that the cucumber's actions made God angry. I think even if I were religious and that was a lesson I wanted to teach to my children (which, even if I were religious, I doubt I'd want to teach my kids that they could anger God by being bad and that they had to ask Him for forgiveness, but to each their own) I just don't think I'd want it coming from a cucumber. Those are personal lessons that I'd like to share with my children on my own time, in my own words. I don't want a dancing vegetable to do it for me. I don't want my television (which makes me feel guilty enough) telling my kids what they should feel bad about and what they should be afraid of. So, right now, we're in a compromise. We'll watch the episode, and I'll click it off before the last five minutes arrives. It's working for us. Your story made me smile. My kids like Veggie Tales too. I've been happy they are learning their Bible stories, even if it is from vegetables! I've never really sat down with them and watched it before. Maybe I should. Sorry, that's just dumb. What is with so many "open-minded" parents saying how they'll let their kids choose their own path, and they'll introduce them to all kinds of religions.....EXCEPT CHRISTIANITY? It's not open-minded, it's ridiculous. Do you seriously think your children will be harmed, or "worse," turn into Bible thumping bigots, if they watch the last 5 minutes of Veggie Tales? If you consider yourself open-minded, you need to walk the walk. I'm sure you'd have no trouble letting your kids watch Kai-Lan if she was talking about her Chinese religious ceremonies. So why when it comes to--gasp--Bible stories, do parents suddenly slam their open minds shut and grab their children away, covering their eyes from possibly being exposed to any of its lessons? I don't care for it, but I'm not religious. I love moral stories but then there was a big dose of bible & God in there. I'm not prepared to explain religion to my children, who do not at all yet comprehend abstract concepts. What an odd and presumptious comment to make. I'm Catholic, actually, I just haven't decided whether I'm going to teach it to my kids yet (which,to true Catholics, means I'm not Catholic, really). If Kai-Lan were talking about religion, I'm sure that would make me uncomfortable to (again, not saying my feelings are correct, but that doesn't mean they're not there.) The kids don't like Kai-Lan, so it's not an issue. Please to be adding a space after the comma and an extra o to the too. I'm having a lot of trouble posting comments for some reason, and I didn't look that over at all, as it was my third attempt. 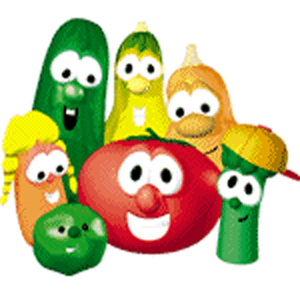 Personally I have been unable to take Veggie Tales seriously since I had a talking Larry the Cucumber plus in college. You'd smack it to get it to talk...it was hilariously phallic and a hit at parties. If the only "religious" part is at the end I'd let him watch it and shut off the religious part. I'd rather be the one explaining that to him and I do intend to put Garrett in Hebrew school when he's old enough. However I think when you take the stories in the Bible/Torah/Koran or any religious writing you are teaching proper lessons. I just don't think they need to be rooted in a "god will be angry" sort of way. It destroys the lesson when you try to teach them to be in fear of doing the wrong thing. Ok seriously, after typing something like that you may as well just stop typing, because you've already alienated the person you are trying to have a discussion with. I think you have what looks like the beginning of a well thought out idea, but you need to work a bit on the delivery. Darlena, I had the same experience with Veggie Tales. I think it's a cute show and there's often a good message, but it gave me personal discomfort where there was mention of God and in a few cases, Jesus. This was based on my own horrible experiences with the church, which I won't go into on here, but needless to say I have a lot of trust issues when it come to organized religion as a result of my own personal experience. Back to Veggie Tales, I also thought about not letting it run through the last few minutes. After some more thought I decided that maybe hearing that kind of message from one show would (at most) simply provoke Aias to ask me about what "God" and "Jesus" are in the future. We don't take him to church and we don't often find ourselves in the midst of religious anything, so his exposure through Veggie Tales would be so minimal. If and when he asks about God or Jesus, I'll explain to him that they are characters in popular and historical culture and that many people believe they are real. He'll have to come any other conclusions on his own or through asking well thought out questions, research, and critical thinking. Aias also watches Curious George, Sesame Street and Yo Gabba Gabba from time to time, and there are lots of mythical or nonsensical notions in those shows as well and I don't think they will have any negative bearing on him in the long run. We skip the end of the videos, too. As an Episcopal (which doesn't really count as Christian to some) I'm not too comfortable with the image of god as the "I'm not mad, I'm disappointed" parent. I don't like it when people tell kids, "When you do that, you make Jesus cry." :P "Just don't do it (being selfish, mean, and so on) because it's wrong and you know it," is the stance I take. If you get a chance, watch the Minnesota Cuke episodes. They're a play on Indiana Jones and they're hilarious. Also, all the Silly Songs with Larry compilations are fun.